2. DVF stud clutch $595 via Shopbop --- SG's choice, just enough studs without going over! I am helpless in trying to decide which pair of shoes to pick. Can I have all 3??? 9. Blank denim $69 via Saks --- I am not too sure about studs on clothing but on a pair of shorts can be quite cute for the summer. This would be the ultimate piece for SG. 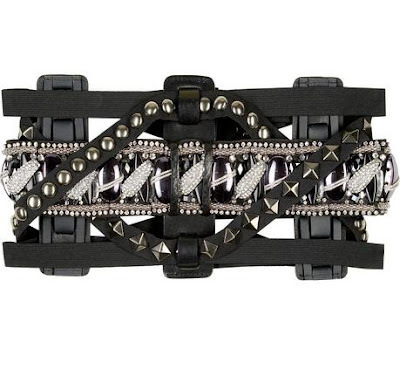 Isn't this Balmain wide belt stylish yet edgy? However this price is not so savvy at $1535 (via Net-a-Porter), ouch! So savvy readers, what do you think of stud trend and do you have a favorite piece yet? The only studs I like are diamond and pearl stud earrings. 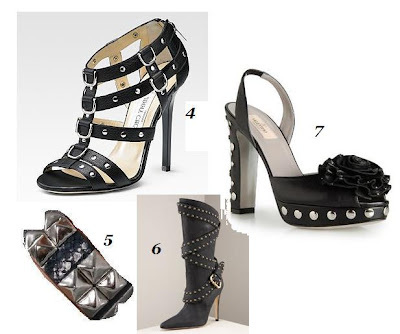 Hi there-fabulous selection, its great that studs are still bang on trend-I love those Jimmy Choos!! I like the Jimmy Choo, I want one!! I love the Jimmy Choo's! I adore Jimmy Choo Saba. I want one too! i like the studs! especially on the bags! the jimmy choo bag is gorgeous but so pricey! Ilove studdes! Balmain belt, Gilbert leather jacket and Valentino sandals are awesome! WANT! looks like studs are here to stay. love love love that dvf clutch. it is so elegant! I love the DVF metallic foldover clutch. So nice! the choo's are my fav!